These pictures were all taken in the long, narrow triangle from Zalingei on the west to El Obeid and Kadugli on the east. 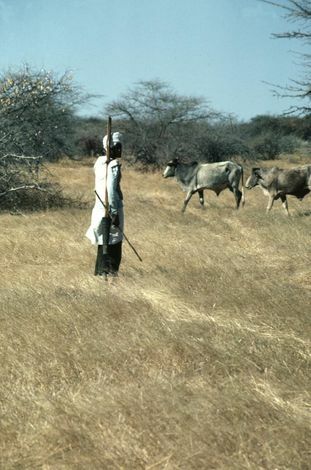 The Nyala neighborhood: about as pristine an image of cattle-nomads as one might hope for. But things aren't quite what they seem, for the land is part of the domain of a parastatal savanna-development corporation, and grazing restrictions are in force. The spot isn't half-an-hour's drive to the housing compound where the corporation's European consultants lived, lemonade in the fridge. The plastic jug is interesting. It's not the only item from faraway: flipflops are also high on the list. 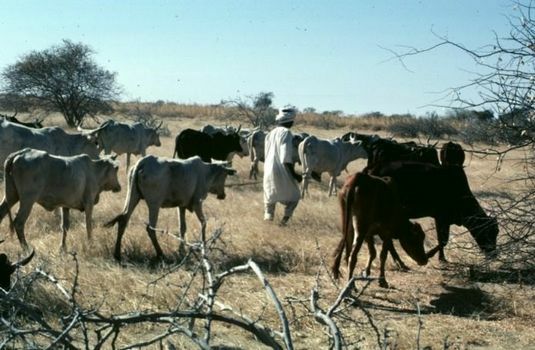 Cattle and camel nomads overlap in this part of Sudan, with the cattle generally migrating in more southerly tracks and leaving the Sahara to the camels. 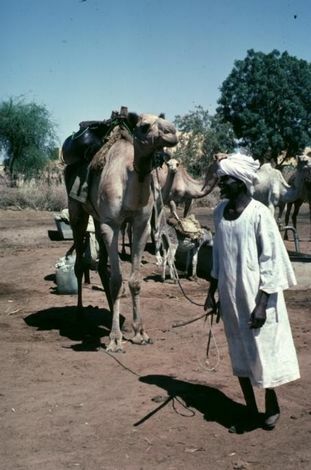 The camels do come into the savanna country in the dry season. Here they congregate near a shallow well dug in a dry streambed. 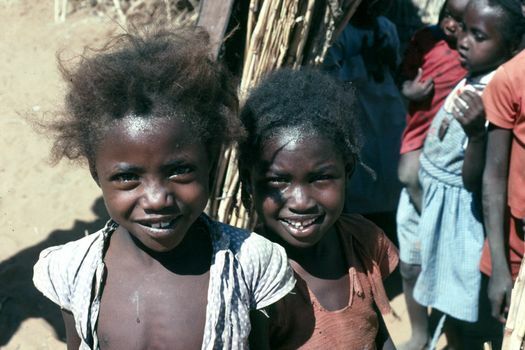 They drink on their own accounts and also carry water for their owners. The acacia forest is extensive, though the groundcover here is severely denuded. 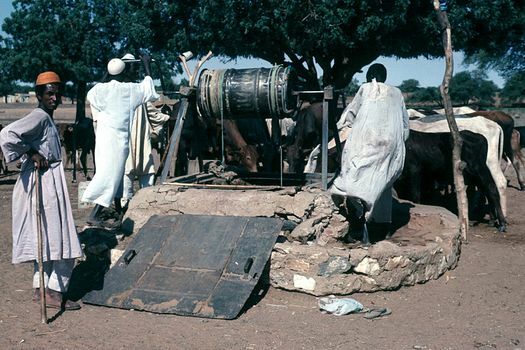 An oildrum comes in handy for hoisting water from deep wells. Where enough water can be found in shallow wells, vegetables like these onions can be grown. 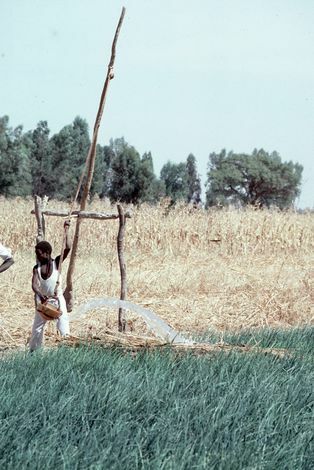 The irrigation technology is the ancient shaduf, its mud-bulb balancing the water lifted in the split gourd. Action! But notice that T-shirt, probably from China. 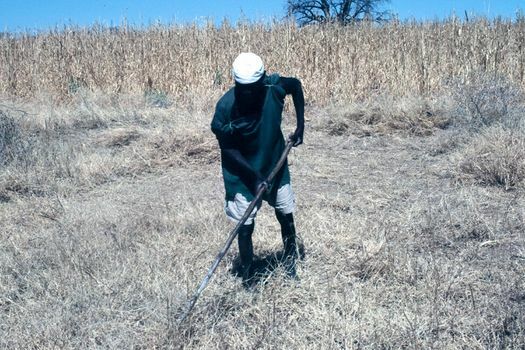 Without irrigation, the staple is sorghum, grown in a wide belt that stretches across the savannas of North Africa much as the Cotton Belt once stretched across the American South. 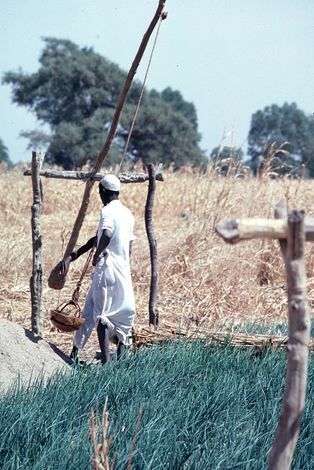 The production methods range all the way from digging sticks to mechanized equipment, introduced late in the British period, when Sudan was seen as a potential imperial breadbasket. The soil's still there, but politics have polished off those development dreams. 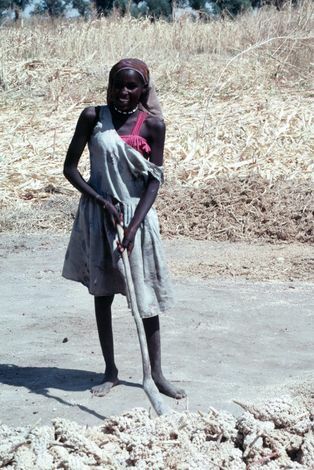 A Fur girl flails sorghum heads. The magenta halter-top presumably bounced in the back of a lorry all the way from Port Sudan, to which it came from the Far East. 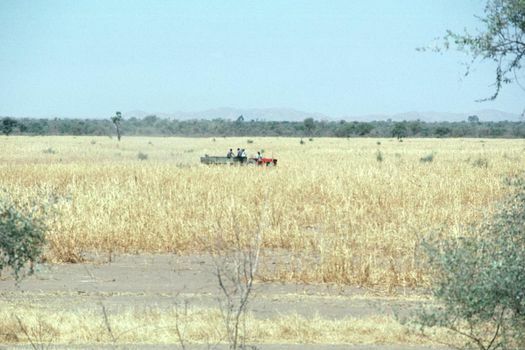 An example of mechanized farming: a huge field on the road between Nyala and Zalingei. 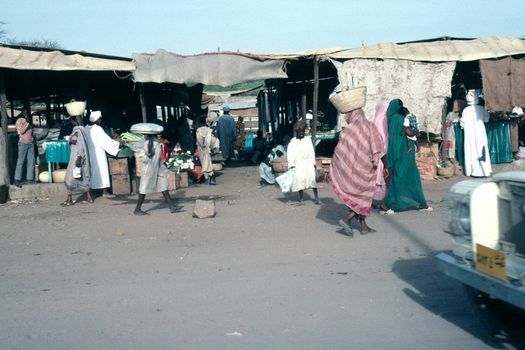 The marketplace in El Obeid, on the north side of the Nuba Mountains. Despite a range of vegetables, the staples are sorghum mush and a slippery spinach, much beloved and seriously overcooked by the Sudanese. 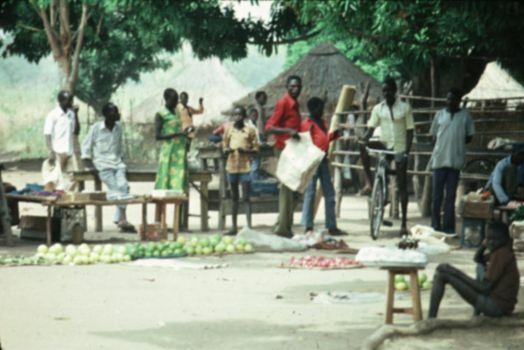 A local market. Grapefruits are a Sudanese specialty, especially if one will tolerate a pile of seeds in exchange for intense sweetness. 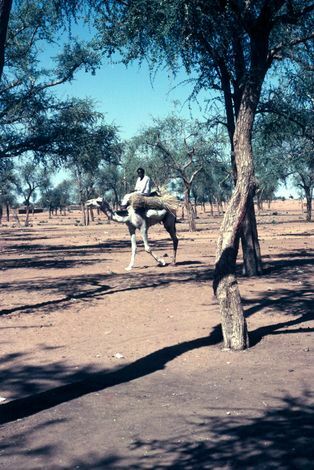 A village near Kadugli, in the Nuba Mountains some 300 air-miles southwest of Khartoum. 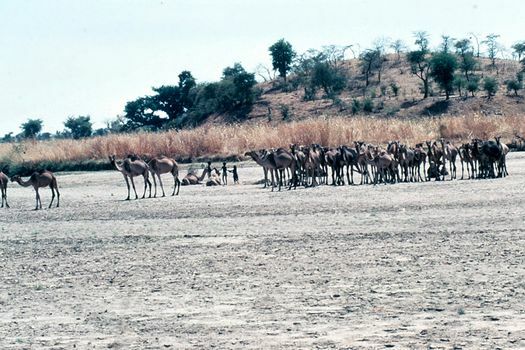 This is southern Kordofan, between the Sudd on the south, where the White Nile passes through a huge papyrus swamp, and savanna on the north. 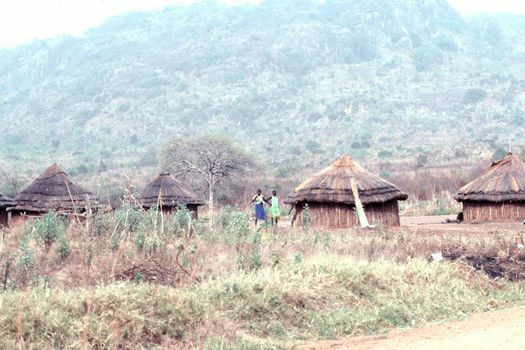 The volcanic plugs of the Nuba Mountains create a distinct landscape in this otherwise flat part of the world, and they provide a much-needed refuge. Despite the thatch, trade goods have clearly found their way to the village; so of late have slavers, reinstituting a business that the British stopped. 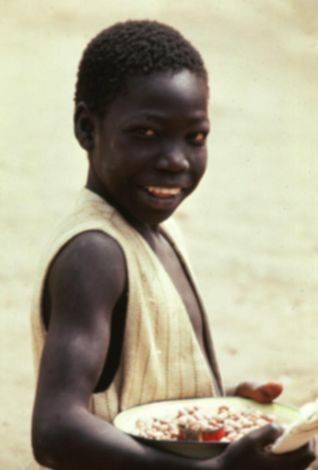 Contacts from the outside are nothing new in western Sudan: the country's name translates as "land of the blacks" and was applied by Arabs from the north. 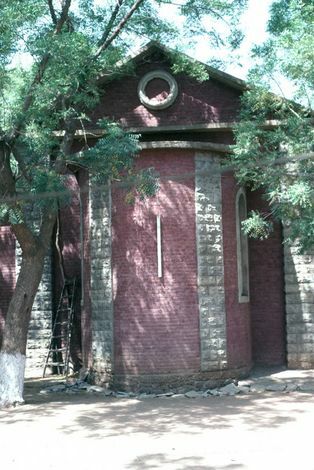 Christianity, too, has had a long history of waxing and waning in Sudan: here, one of the small churches built during a waxing period in the early 20th century. Built by Italian priests, it's in Kadugli. What should the school curriculum be? 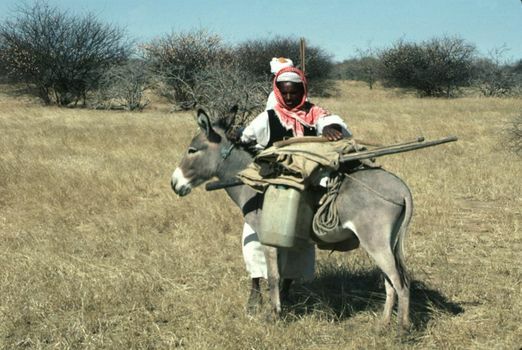 In the British period there was a teacher-trainer in the Sudan who ripped up greenery planted on his school grounds. If the students saw it and grew fond of it, he reasoned, they'd be useless back in the villages where they'd be sent to teach. 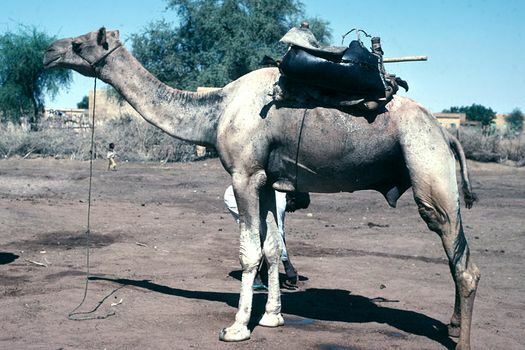 But schools aren't needed if the curriculum is the old ways of camel-raising and sorghum-growing. They're needed only if you want to introduce change. Tricky thing, change, especially if after 50 years of independence the only thing that's risen is expectations. 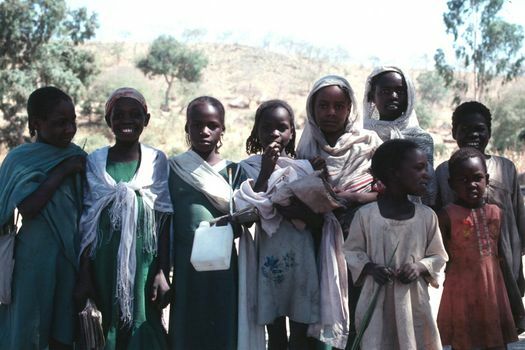 Girls near Jebel Marra, along the road between Nyala and Zalingei.